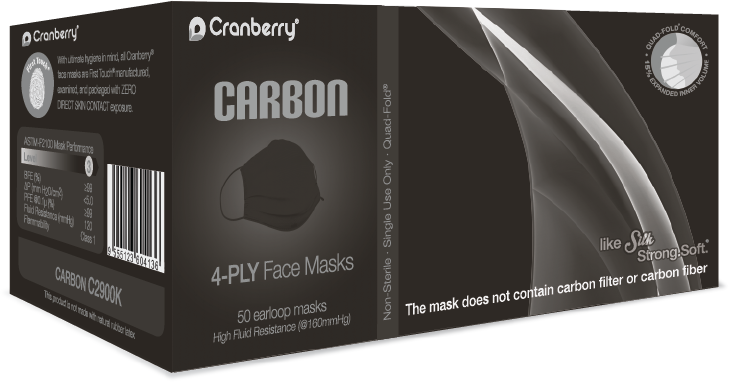 Carbon® Face Masks offer ASTM Level 3 protection with high fluid resistance and greater than 99% BFE/PFE at 0.1 micron. Quad-Fold® design provides greater comfort with 15% more breathing volume. Nose and chin adjustment stripe for better fit and protection. Carbon Black Face Masks* offer ASTM Level 3 protection with high fluid resistance and greater than 99% BFE/PFE at 0.1 micron. Quad-Fold® design provides greater comfort with 15% more breathing volume. Nose and chin adjustment strips for custom fit and protection.